The content of the Hand Book is organised to provide a rapid yet comprehensive understanding of this topic. 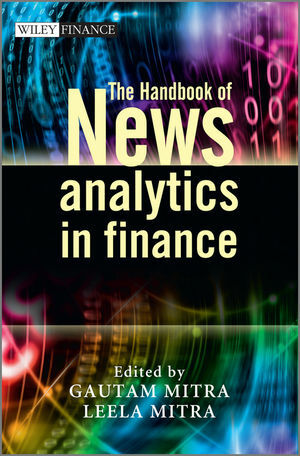 Chapter 1 sets out an overview of News Analytics (NA) with an explanation of the technology and applications. The rest of the chapters are presented in four parts. Part 1 contains an explanation of methods and models which are used to measure and quantify news sentiment. In Part 2 the relationship between news events and discovery of abnormal returns (the elusive alpha) is discussed in detail by the leading researchers and industry experts. The material in this part also covers potential application of NA to trading and fund management. Part 3 covers the use of quantified news for the purpose of monitoring, early diagnostics and risk control. Part 4 is entirely industry focused; it contains insights of experts from leading technology (content) vendors. It also contains a discussion of technologies and finally a compact directory of content vendor and financial analytics companies in the marketplace of NA. The book draws equally upon the expertise of academics and practitioners who have developed these models and is supported by two major content vendors - RavenPack and Thomson Reuters - leading providers of news analytics software and machine readable news. Gautam Mitra (London, UK) is an internationally renowned research scientist in the field of computational optimisation and modelling. He has developed a world class research group in his area of specialisation with researchers from Europe, UK, USA and Asia. He has published three books and over one hundred refereed research articles. He was Head of the Department of Mathematical Sciences, Brunel University between 1990 and 2001. In 2001 he established CARISMA: The Centre for the Analysis of Risk and Optimisation Modelling Applications. CARISMA specialises in the research of risk and optimisation and their combined paradigm in decision modelling. Professor Mitra is also a Director of UNICOM Seminars and OptiRisk Systems; OptiRisk specialises in the research and development of optimisation and financial analytics tools. Leela Mitra (London, UK) is a Quantitative Analyst at OptiRisk Systems. Dr Mitra joined OptiRisk System as a Quantitative Analyst in 2004. She received her PhD in Operational Research on the topic of "Scenario generation for asset allocation models" from CARISMA, Brunel University. Topics included "mixed" scenario sets for investment decisions with downside risk, pricing and evaluating a bond portfolio using a regime switching Markov model and desirable properties for scenario generation. She has a first class BA (Joint Honours) degree in Mathematics and Philosophy from King's College (University of London). Prior to joining OptiRisk, Leela worked in the pensions industry as an actuarial consultant for Mercer HR and subsequently with Jardine Lloyd Thomson. She is part qualified as an actuary. 1 Applications of news analytics in finance: A review (Leela Mitra and Gautam Mitra). 1.3 Turning qualitative text into quantified metrics and time-series. PART I QUANTIFYING NEWS: ALTERNATIVE METRICS. 2 News analytics: Framework, techniques, and metrics (Sanjiv R. Das). 3 Managing real-time risks and returns: The Thomson Reuters NewsScope Event Indices (Alexander D. Healy and Andrew W. Lo). 3.4 A framework for real-time news analytics. 3.6 News indices and FX implied volatility. 3.7 Event study analysis through September 2008. 4 Measuring the value of media sentiment: A pragmatic view (Marion Munz). 4.2 The value of news for the US stock market. 4.4 News moves stock prices. 4.6 Regulated vs. unregulated news. 4.7 The news component of the stock price. 4.10 Corporate senior management under the gun. 4.11 A case for regulated financial news media. 4.12 Wall Street analysts may create "material" news. 4.13 Traders may create news. 4.15 News sentiment used for trading or investing decisions. 4.17 Backtesting news sentiment systems. 4.18 The value of media sentiment. 4.19 Media sentiment in action. 5 How news events impact market sentiment (Peter Ager Hafez). PART II NEWS AND ABNORMAL RETURNS. 6 Relating news analytics to stock returns (David Leinweber and Jacob Sisk). 6.3 News data structure and statistics. 6.4 Improving news analytics with aggregation. 6.5 Refining filters using interactive exploratory data analysis and visualization. 6.6 Information efficiency and market capitalization. 6.7 US portfolio simulation using news analytic signals. 6.8 Discussion of RNSE and portfolio construction. 6.9 Summary and areas for additional research. 7 All that glitters: The effect of attention and news on the buying behavior of individual and institutional investors (Brad M. Barber and Terrance Odean). 7.6 Asset pricing: Theory and evidence. 8 The impact of news flow on asset returns: An empirical study (Andy Moniz, Gurvinder Brar, Christian Davies, and Adam Strudwick). 8.1 Background and literature review. 8.2 Aspects of news flow datasets. 8.3 Understanding news flow datasets. 8.4 Does news flow matter? 8.5 News flow and analyst revisions. 8.6 Designing a trading strategy. 9 Sentiment reversals as buy signals (John Kittrell). 9.2 The quantification of sentiment. PART III NEWS AND RISK. 10 Using news as a state variable in assessment of financial market risk (Dan diBartolomeo). 10.2 The role of news. 10.3 A state-variable approach to risk assessment. 10.4 A Bayesian framework for news inclusion. 11 Volatility asymmetry, news, and private investors (Michal Dzielinski, Marc Oliver Rieger, and Tonn Talpsepp). 11.2 What causes volatility asymmetry? 11.3 Who makes markets volatile? 12 Firm-specific news arrival and the volatility of intraday stock index and futures returns (Petko S. Kalev and Huu Nhan Duong). 13 Equity portfolio risk estimation using market information and sentiment (Leela Mitra, Gautam Mitra, and Dan diBartolomeo). 13.3 Updating model volatility using quantified news. PART IV INDUSTRY INSIGHTS, TECHNOLOGY, PRODUCTS AND SERVICE PROVIDERS. 14 Incorporating news into algorithmic trading strategies: Increasing the signalto-noise ratio (Richard Brown). —So, how can one incorporate news into algorithmic strategies to improve trading performance? —So, how does one increase the signal-to-noise ratio, ensuring protection from unforeseen exposures without an excessive number of halts or items to review? —Sounds logical, right? So how exactly can this be done? —So what about offensive strategies? How can one generate alpha using news? 15 Are you still trading without news? (Armando Gonzalez). —The underpinnings of news analytics. —Finding ‘‘liquidity’’ in the news. 16 News analytics in a risk management framework for asset managers (Dan diBartolomeo). 17 NORM—towards a new financial paradigm: Behavioural finance with newsoptimized risk management (Mark Vreijling and Thomas Dohmen). 17.2 The problem of incomplete information in market risk assessment. 17.3 Refining VaR and ES calculation using semantic news analysis. 17.4 The implementation of semantic news analysis. 17.6 NORM uses semantic news analysis technology. 17.7 Conclusion: NORM contribution to risk assessment. 18 Question and answers with Lexalytics (Jeff Catlin). 19 Directory of news analytics service providers. The Chartered Institute for Securities & Investment.